I wasn’t planning to write another blog post until we got to Oban, I really wasn’t. What changed my mind? It was the surreal moment when we thought we’d walked onto the set of a Coen Brothers’ Movie. We’re still in West Lothian. The teeth are fixed, the hair is cut, Boo has been trimmed to the bone and looks like his head is too big for his body and we’ve remembered most of the things we needed to do before we set off up north. We got back from East Lothian yesterday and decided to go for a Carvery lunch before we went to the hairdressers. TheToby Carvery in Bathgate has been one of our regular haunts for the ten years we’ve lived here. We like that the staff know us, the food is real – as in fresh vegetables and roast meats – and the price is right. The first thing that struck us was that they had changed the décor since we were last in there. In itself this isn’t too odd but it gave the place a slight sense of the unfamiliar. Sitting down we began to notice the odd behaviour of a couple sitting close by. They were obviously away on what was once called a ‘dirty weekend’ – I’ve no idea what the correct expression is in the 21st century. As we sat down to our plate of meat and six veg we were treated to a series of loud and unmistakeable double entendres. Frankly it was enough to put me off my cauliflower cheese. At the same time, at a table just behind us there was a pair of mature ladies. I use the word ‘mature’ advisedly. One of them must have been at least ninety. I know it isn’t proper or polite to be anything less than respectful of the elderly but this lady had a voice with the timbre of a sea lion and just as loud. So in between the filthy comments and howls of lascivious laughter from the people on our right, our meal was punctuated by sudden unintelligible honks from behind. The overall ambiance was disturbing enough to put us off having a pudding – yes it was that bad. After the hairdressers, we made our way to our campsite for our last two nights in central Scotland. It is on a farm. I won’t mention the name in case my description has a negative effect on their business but enough to say – this place is weird. By the time we had been shown to our ‘pitch’ – a small parking place between two huge caravans and beside a dead tree – we were verging on hysteria. The farm is lovely. 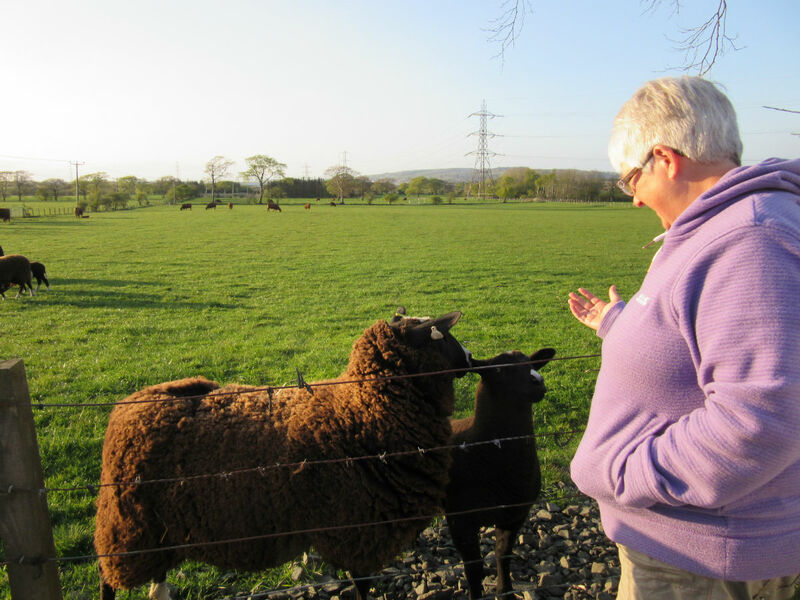 Beautifully cared for Angus cattle and sheep of the rare breed variety (names have been withheld to protect the innocent) – but the caravan site is like something from Cold Comfort Farm. Most of the caravans look like they’ve been here for years – as do some of the occupants – which leads me to the final character in this Fargo-esque film set. Shirley was walking the dogs (yes her foot is much improved) and I was pottering around filling up with water from the tap that had taken me ten minutes to find last night. Getting to it involves walking close to a couple of these aged vans that are placed at jaunty angles around the place. On my way back, a lady leapt out of her van and cornered me. I was a little uncomfortable at this point, partly because I couldn’t understand a word she was saying and partly because I was holding a full watering can, causing one of my arms to grow a full inch longer than the other. I had no choice but to put the watering can down, thereby rendering my escape impossible. Within minutes it became obvious that the overly friendly lady was in fact drunk as a skunk. Shirley, being the extrovert soul that she is, appeared from the dog walk and came trotting over, thinking that I’d made a new friend. I tried to warn her with my eyes but she was oblivious. What followed was as farcical as it was frustrating. We simply could not rid ourselves of our new-found friend. She managed to get Shirley to show her the route of our whole planned trip round Scotland on a map she pulled out of her van. She then made friends with the dogs and – horror of horrors – invited herself into our van to see the layout. I genuinely thought I was going to have to climb out of a window and call for help when suddenly she decided it was time to go and went weaving across the gravel back to her van. We’ve spent the evening hiding from her. All this has reminded me of the value of good neighbours and one huge advantage of the travelling life. We’re only here for two nights. Interesting story. Boo looks beautiful with his new do. Was this woman traveling alone? Makes for an interesting story. I’ve contacted fiverr.com and am going to see if someone can help me reorganize our blog. BTW, it’s TwinksandSparky.blogspot.com. I didn’t realize I had posted so much but want to resume posting, pictures and commentary when we are in San Miguel de Allende and our adventures driving there. The documentation will come in handy to keep us entertained in the old folks home! It will grow Darlene. More pictures in a couple of weeks. ? Some wonderful fodder for your travel book Mags, may you dine out on it for years. No Pudding!!! must have been bad.